Where do you go after you've played the prince-slapping scion of Casterly Rock? Well, if one guy gets his way, you play a giant, psychic head. Captain America: The First Avenger has made hundreds of millions of dollars at theaters all over the world, making a sequel seem like a very safe bet. 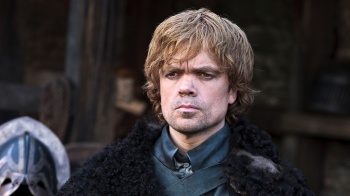 While some are talking about another World War 2 adventure, Last Avenger co-writer Christopher Markus has a very different sequel in mind: Peter Dinklage, perhaps best known as Tyrion Lannister in Game of Thrones, as the bizarre high-tech villain MODOK. In the comics, MODOK - which is an acronym of "Mental Organism Designed Only for Killing" - is the mutated technician George Tarleton. The mutagens used to create him gave MODOK incredible intelligence and psionic powers, at the cost of warping his body so that his head became too large for it to support. Because of this, he needs mechanical assistance to move around: an exoskeleton that MODOK has outfitted with all kinds of weapons to supplement his already fearsome mental abilities. MODOK recently appeared in Marvel vs. Capcom 3. Markus said that he loved MODOK as character, and thought that it was possible to make a really good movie using him as the villain. He admitted that he hadn't been able to get many people to agree with him so far, but said that Dinklage might be the ace up his sleeve. "I will win you over to Peter Dinklage as MODOK," he said. "If he came around the corner and you saw him floating there you would be terrified. It would be amazing." Sadly, as much as I would like to see the amazing Peter Dinklage get more work, I'm not sure that MODOK is a role that we will see him - or anyone else, for that matter - play any time soon. Like superhero costumes, MODOK is one of those things that looks great when Jack Kirby draws it in a comic, but doesn't look quite so good in the real world.